I’m sure every designer organizes their business in different ways, but I thought I’d share with you a little bit of how I’ve chosen to organize things. Right now, since I’m primarily focused on working on both my next book of my own designs and Hitch, I don’t worry about keeping track of various calls for submissions and so on — simply because I’m saying ‘no’ to nearly everything that comes up. 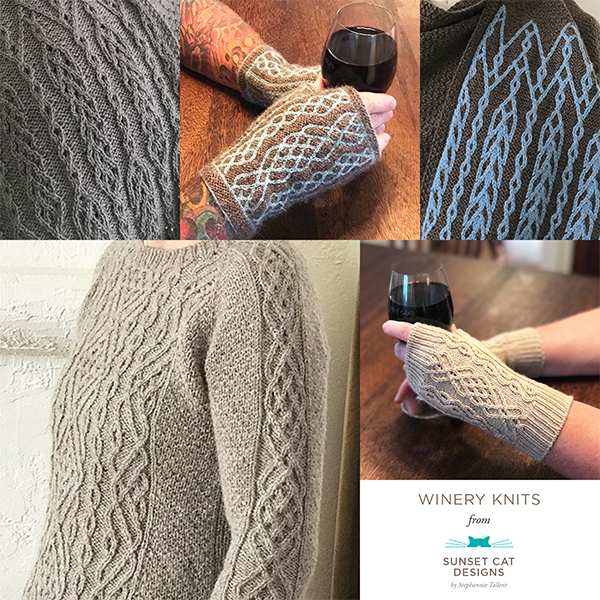 I do have an Excel document that lists all my patterns, and where they’re published (through Cooperative Press, on Ravelry, on Craftsy, through Deep South Fibers, on KnitPicks, etc). I refer to it to see where I still need to upload patterns, where to update patterns if errata is found, and so on. Each project (Hitch & the new book) has its own Excel document (or Excel & Google Doc, in the case of Hitch). I keep track of designs, yarns, colorways, etc on these. One of the things I do, that I don’t know if others do, is sort the projects based on colorways to see if I need to change anything for better balance of colors. (This comes in to play because I have an overarching palette for each collection.) I keep track of whether I’ve requested and received yarn. I try to come up with monthly goals & what project I should be working on at what time. I keep track of whether or not the sample will be knit by a sample knitter, who that knitter is, and so on. I have a folder for Patterns Published and one for Patterns in Progress. Patterns Published is divided into either collections/books or type of patterns. California Revival Knits has its own folder, with pattern subfolders underneath it. I have folders for sweaters, mittens, socks, scarves/cowls/shawls, and so on. Each pattern gets its own folder within its category, with subfolders for charts, photos, etc. Patterns in Progress has either collection/book folders, with individual patterns as subfolders, or just pattern folders, for standalone patterns. It also has a subfolder called Patterns Turned In, which are patterns that are completed, but not yet published. I also have folders for the classes I teach, ads for Ravelry, tech editing, and so on. All these folders are kept in Dropbox, which means they’re on my laptop, Dave’s laptop, and our desk top. I’ve also saved them to an external hard drive attached to the desktop. I don’t update that as often as I probably ought to. For things that aren’t digital, I have a couple zip binders (similar to these, but more plain) with plastic sleeves. I store old swatches, sketches, handwritten design notes that I want to keep, colorcards, etc in these. Periodically I’m consumed with the need to procrastinate go through and streamline all of this: I’ll standardize file names, delete what I think is fine to delete, and so on.